Yeah, I did. I did mention pumpkin already. But in my defense → also chai. doughnut. muffins. And maybe it’s not quite yet time for flannel and chunky sweaters and scarves and colored leaves and crisp, cool air, but friends — it is always time for these muffins. I really blame (thank?) the school supplies section at Target for my early pumpkin obsession. I was there the other day, as I always am, perusing the shelves for new pillows and candles instead of the groceries that I actually went there to buy. After deciding that, OK, having approximately two dozen throw pillows at home and an equal number of candles is probably enough, I walked out of the pillows/candles section and straight to the school supplies. Seeing the pencil cases and rubber erasers and fresh, clean notebooks ignited within me fond memories of first days of school (that means my memories skipped over those awkward days of middle school, obvi). My thoughts then moved on from school to fall, and in thinking about how much I love fall, with all its pretty colors and cooler weather and apple picking and pumpkin patching, suddenly I found myself in the baking aisle shoveling cans of pumpkin into my cart. And the day after that, I was baking these delightful muffins o’ pumpkin goodness in my kitchen. There aren’t any photos of the process of making these muffins and that’s because I baked them at night, and the one downside to fall is that nighttime (also known as “lack of sunlight” in food blogger land) comes quicker. But you pretty much just missed out (unless you’re following me on Snapchat! –> stephmwise) on some batter being mixed together, spooned into a muffin tin, baked into muffins, brushed with butter and rolled in a cinnamon-sugar mixture that I swear is accompanied by the sounds of a choir of angels. So that might seem like a lot to miss but really, the most important part is the final product. Because you get to eat it. A few more notes: I used pumpkin chai tea to steep in the milk before adding it to the batter, but regular chai works just as well. The chai flavors are subtle, mostly because they are so similar to that of pumpkin spice, but they pair perfectly with the sweet cinnamon sugar. The texture and crumb of these muffins is just like a baked cake doughnut, all soft and tender and delicious-like, which I really love. And don’t be tempted to skip out on the butter-cinnamon-sugar coating to make them healthier. Trust — it’s worth the indulgence. Also, DO be tempted to brown the butter before brushing it onto the muffins. I almost did this, but my impatience got the best of me and, like an adult, I shoveled one of these muffins into my mouth as soon as it was coated. WINNING. In case you forgot: Pumpkin. Chai. Doughnut. Muffins. Four little words to carry you through the fall baking season. P.S. Have you entered the Joseph Joseph bread bin giveaway yet? There’s still time! Pour milk into a mug or small microwaveable bowl. Heat in microwave 40 seconds until hot (but not scalding). Steep tea in milk 10 minutes. Meanwhile, heat oven to 350 degrees F. Butter and flour 12 standard muffin cups. In a medium bowl, whisk flour, baking powder, salt, nutmeg, allspice, cardamom and baking soda until well combined. Remove tea bag from milk, squeezing out any extra liquid and flavor from bag. Pour milk into a small bowl and stir in canned pumpkin until mixture is well combined. In a large bowl or bowl of a stand mixer, beat butter and brown sugar on high speed 1 to 2 minutes until light and fluffy. Add eggs, one at a time, beating well after each addition. Using a spatula, wooden spoon or stand mixer on low speed, alternate stirring in flour (in 3 additions) and pumpkin mixtures (in 2 additions), beginning and ending with flour mixture, just until batter is combined. Spoon batter evenly into prepared muffin cups. Bake 30 minutes until a toothpick inserted in center comes out clean. Cool muffins 10 minutes in pan on a cooling rack. Meanwhile, in a small bowl, whisk together sugar and cinnamon. One at a time, remove muffins from pan and brush tops and sides with butter, then roll in sugar-cinnamon mixture. Transfer to cooling rack to cool completely. Perfect pumpkin goodness right here! Love that Chai flavour! It’s never too early for pumpkin baked goods!! : ) I love that you also infused chai though..sounds amazing. I had my first PSL of the season this morning and so I’m definitely in the fall baking mood already! Bring on the fall! It’s time for pumpkin and tea and apples and leaves- and for baking sweet treats such as these. Lovely! I have too been drowning in throw pillows and candles recently. Finishing decorating my apartment isn’t helping because I walk into Target and buy ALL of the things. And I’m right there with you on being ready for fall, especially if it means I can devour these delicious muffins! Saw these on Snapchat!! haha 🙂 They sound delicious. We don’t have Target here in Canada, and given the stories I hear about it’s addictive nature, I’m kind of glad (and maybe a little sad) about it. I am SO ready for Fall and pumpkin everything. Plus you totally had me with the word doughnut! I heard the choir of angels when I read the title of this post. It will be chilly here in Michigan this weekend and there will be singing at my house. ; ). Thanks so much. Target is very dangerous. I usually have 1 item to buy and end up with 20 items later. 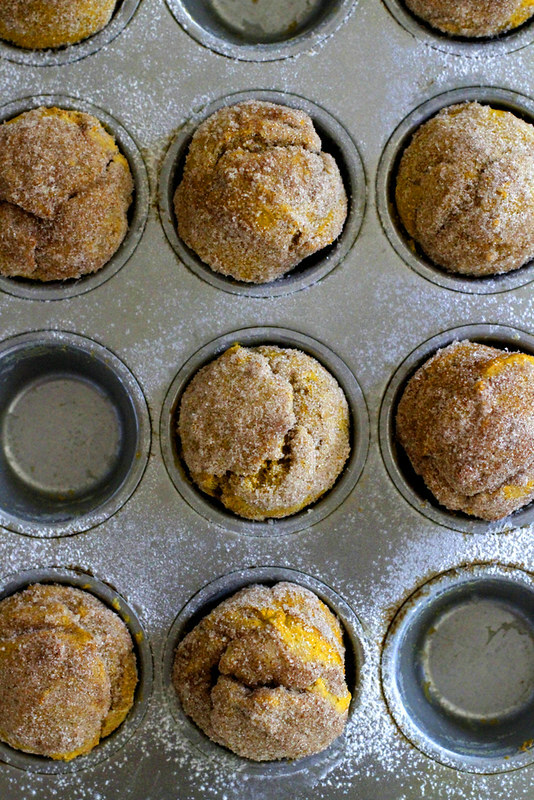 These doughnut muffins are adorable and love the flavors of fall. Fall is the BEST season. I look forward to it every year. I can’t wait for sweater weather! Also, love these doughnut muffins. These look PERFECT. Like, I’m craving pumpkin now, and I haven’t been yet but your photos just make me want it! Looks amazing Stephanie! I also am a huge fan of school supplier. Some might say a hoarder of school suppliers. I don’t like to surround myself with those people. 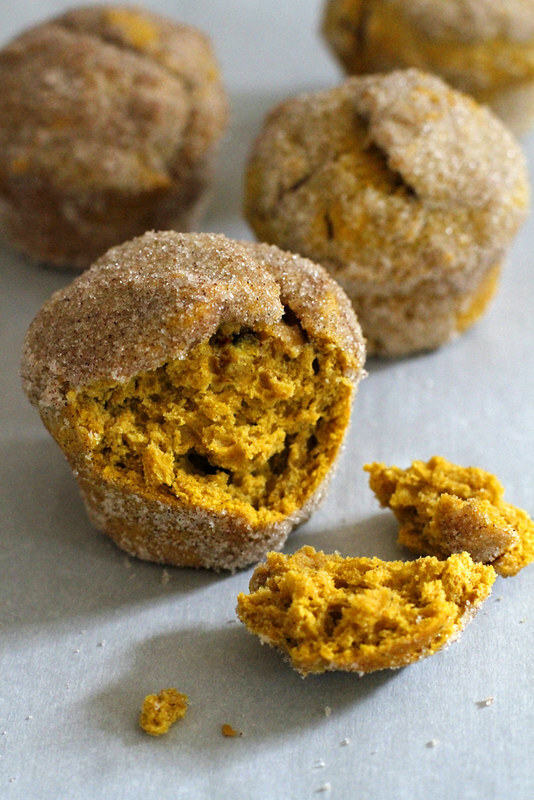 If I did, I might also have to share these pumpkin doughnuts muffins, which I for SURE don’t want to do. Amazing! The picture of these beauties opened well before the text did on my I-pad. I saw the orange color of the muffins and, while waiting for the text to load, said out loud to nobody, “oh please be pumpkin!” I was so excited to see the title and can’t wait to try them. Thank you from all the pumpkin-aholics. And feel free to start the pumpkin recipes even earlier next year! 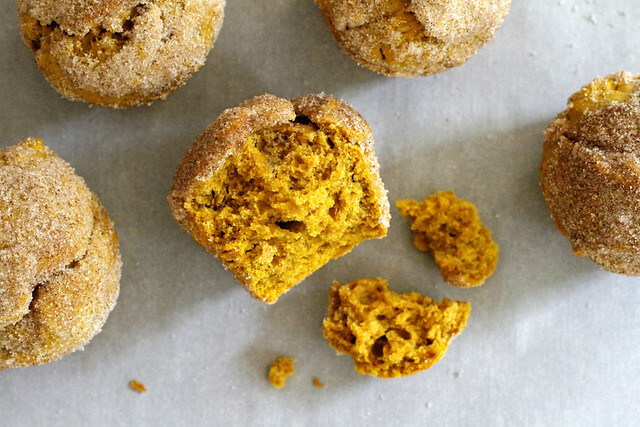 You had me at pumpkin and chai, these muffins look dreamy! 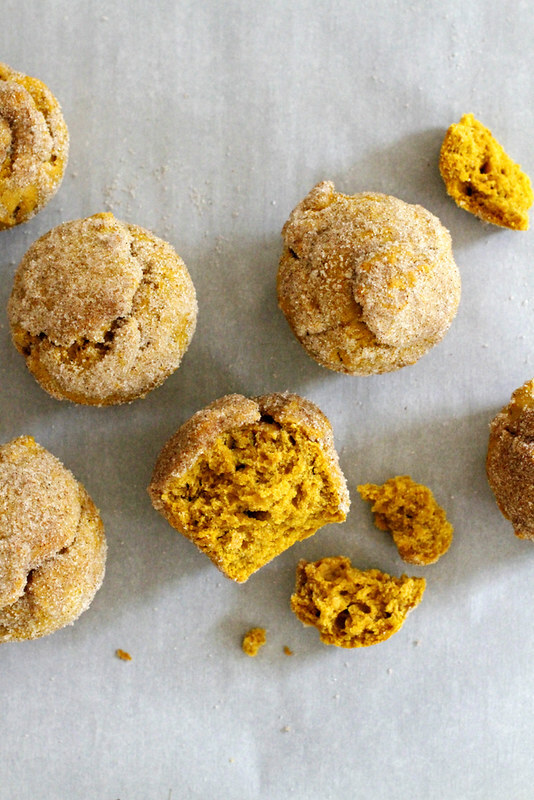 I love chai and I love pumpkin…how can I not love these! Can’t wait to try! I have these in the oven right now and the house is starting to smell wonderful! I don’t make a lot of muffins and discovered I don’t have a regular size muffin pan, only jumbo and mini, so I’m using the jumbo and I expect it will need to bake a little longer.